We have carefully curated our favorite items for running, biking, and hiking that would make great Mother's Day gifts. All items are under $150* and can be found at Sport Chek (*Please note that prices are current at time of writing and are subject to change.). 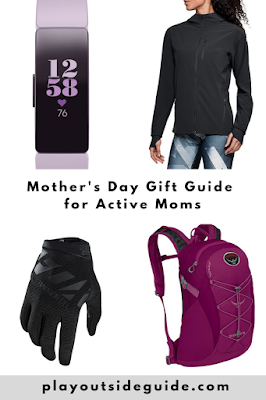 If you'd like to do something fun with Mom and support a great cause, consider signing up for the Sport Chek Mother's Day Run, Walk & Ride (details below). The Fitbit Inspire HR Fitness Tracker is a compact and affordable fitness tracker that boasts five days of battery life and is waterproof (swimproof actually!). Available in Lilac, Black, White/Black. $129.95. Buy Now. The Under Armour Women's Fly By Av Run Cap is a lightweight, stretchy breathable cap with an adjustable strap and reflectors (extra safety for night running). It's also great for hiking! Available in Black, White, or Black/White/Silver. $29.99. Buy Now. For flattering weather protection, try the Under Armour Women's Outrun The Storm Running Jacket. Water-resistant 4-way stretch fabric and thoughtful features like a large hood, thumbholes, interior media pocket, and reflective details, will make this Mom's favorite jacket. Available in Black and Radio Red/Black. $109.99. Buy Now. There's a reason The North Face Women's Perfect Core High-Rise Tights are so popular: they fit well and look great. Extra compression around the midsection keeps your core engaged too. $83.97. Buy Now. The relaxed fit Sugoi RPM Women's Cycling Jersey has a 1/4 zip for temperature control and is perfect for all types of riding. Back pockets are just the right size for protein bars or gels. Available in Raspberry Sorbet or Light Jade. $38.97. Buy Now. The Fox Ranger Gel Mountain Bike Gloves offer a lot of bang for your buck: gel palm protection, padded knuckles, 4-way stretch, and touch screen compatibility! $44.99. Buy Now. With room for 2.5 L of water, extra clothes, and emergency gear, the Osprey Women's Skimmer 16 Hydration Pack is the ideal size for mountain biking and only weighs 460 grams. Its suspension system distributes weight across your back and mesh fabric keeps you from getting too sweaty. $89.97. Buy Now. Stay comfortable and dry with the highly-rated Diadora 7 Inch Road Women's Cycling Shorts. These compression shorts are neither too long nor too short, and have a Coolmax gel chamois and reflective details. $35.97. Buy Now. If you want a daypack that fits well and has features of a big backpacking pack, try the Gregory Women's Jade 28L Day Pack. CrossFlo Suspension distributes the weight and keeps it off your back, hiking pole loops and pockets make for easy packing (the stuff pocket provides easy access to remove/add layers), and the rain cover means your stuff stays safe when the weather turns nasty. Available in Dark Charcoal for $134.97 or Mayan Teal for $194.99. Buy Now. Hillsound Trail Crampons are a must for year-round hiking. 1.5 cm spikes dig in to ice and packed snow to provide superior traction (vs ice cleats). The elastomer harness stretches to fit over your boots and the velcro strap provides extra security so you don't lose your spikes. $64.99. Buy Now. Go green and stay cool with the Marmot Women's Caligata T Shirt. Made of recycled water bottles and cotton, this tee has a fun mountain outline and cheeky marmot on it that will appeal to all mountain lovers. Available in Flamingo Heather and Charcoal Heather. $34.99. Buy Now. The North Face Women's Venture 2 Shell 2.5L Jacket is a compact, ultralight, waterproof, windproof jacket with pit zips for temperature control. Stuff the jacket into its pocket, toss it in your pack, and you're ready for a storm. A relaxed fit and generous hood means you can comfortably wear this shell over layers. Available in 16 colours! $149.99. Buy Now. The Adventure Medical Kit Ultralight 0.7 First Aid Kit comes in an ultralight bag with rugged waterproof liners and all the first aid supplies you need for a dayhike or weekend trip. Includes moleskin, butterfly closures, bandaids, wraps, common medications, and a mini roll of duct tape. We have purchased several Adventure Medical Kits in different sizes, but this is our favorite. $27.99. Buy Now. 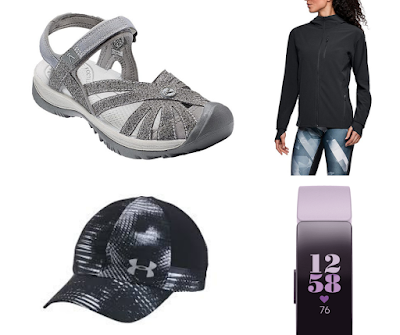 When you need traction and a bit of foot protection, but don't want to wear athletic looking sports sandals, Keen Women's Rose Sandals are just what you need. Available in Gargoyle/Raven or Blue Opal/Blue. $109.99. Buy Now. Spend quality time together while supporting a good cause. This year the Sport Chek Mother's Day Run, Walk & Ride will be held on May 12, 2019 in southwest Calgary, Alberta. Proceeds go to Calgary Health Trust NICU and Canadian Tire's Jumpstart Charities. Jumpstart gets more kids involved in sports by helping families in financial need. Courses include: Little Legs Race for 2-4 year olds, 5 km walk, 5 km & 10 km run, 5 km & 10 km handcycle, and 5 km & 10 km wheelchair. For more information, or to register, please visit https://www.mdrunwalkride.com. Please note that all participants must register and pick up race packages by May 11, 2019. How will you surprise Mom on Mother's Day?